The panel was moderated by Peggy Fox, WUSA News Channel 9 and included remarks from Congressman Don Beyer and Arlington County Board Member Katie Cristol. Joining me on the panel was Dr. Lyndon Haviland MPH, Darkness to Light, Jennifer Alvaro Mental Health Therapist, Arlington County Child & Family Services, Caitlyn Knittig Survivor/Advocate, and Angela Rose founder of PAVE. Those attending the event walked away engaged and ready to advocate for child sexual abuse awareness for all of Northern Virginia. As a direct result of my participation on the panel, I have two Stewards of Children trainings scheduled in Falls Church and have several adults interested in becoming Darkness to Light authorized facilitators at a training to be held in June at SCAN. Others who attended the event were actively engaged in learning how to get Erin’s Law passed in Virginia. As a panelist, I was able to talk about what barriers kept Erin’s Law from being passed this year in the General Assembly and also able to provide thoughts and insight on what we need to do in order to get it passed next year. For many parents, talking about race with children is a difficult concept. Adults often question how much children already know and how much information is appropriate to share, while balancing a need to protect children from the United States’ complicated (and often violent) racial history. We recently taped a Parenting Today segment on this topic with guest Natalie Bailey from the Department of Family Services in Fairfax County through out partnership with iHeartRadio. LISTEN HERE! It is important to note that children are perceptive, and often pick up the nuances of race even without direct commentary. Adults need to realize there may be awkward moments, but by engaging children in conversations about race at an early age and continuing to do so throughout adolescence, parents have an opportunity to shape children’s self-esteem as well as perspectives in regards to race. Each moment is a learning opportunity to affirm children’s questions, challenge stereotypes, and teach children how to navigate an increasingly racially diverse community in positive, productive ways. How are families in your community talking about race and racism? SCAN: Where are you attending school/for what degree? CHAMONE: I am currently in my fifth semester at the University of Southern California, working towards a Master of Social Work degree in Community Organization, Planning and Administration (COPA) an elaborate title for macro-level social work. The University of Southern California’s Suzanne Dworak-Peck School of Social Work program guides students through three semesters of field placement, designed to enhance students’ understanding of vulnerable populations, social and economic injustice and pressing societal problems. I am pleased to spend all three semesters as a Master of Social Work intern at SCAN. MSW Intern Chamone Marshall (right) with SCAN Development Coordinator Sam Hagenow. SCAN: What at SCAN resonates with you? CHAMONE: SCAN’s model of engaging the individual, family and community through their child advocacy, parent-education and public education programs is an ideal medium for academic and professional growth. The diverse structure of SCAN has allotted me the opportunity to work on grant applications, revise volunteer outreach media, and attend relevant community events fostering a more thorough understanding of social service agencies. SCAN: What is your favorite experience at SCAN so far? CHAMONE: While each task, meeting and event provides unique opportunities, witnessing SCAN’s collaboration with iHeartRadio demonstrated an innovative manner for social service organizations to connect with the communities they serve. The opportunity to hear the career paths of some of Virginia’s leaders in social services, and their expertise on issues ranging from discussing race with children in the midst of a racial charged climate to the continuing impact of adverse childhood experiences, through monthly radio sessions shows how vast non-profits outreach can be, and the many ways that agencies can connect with those in need. The medium of communication, radio, highlighted that serving one’s community extends beyond the identified client, and that when broadcast correctly messaging can reach and benefit individuals who may never come in direct contact with a social service agency. SCAN: What kinds of projects are you working on? What else do you hope to accomplish/work on during your time at SCAN? CHAMONE: I’ve been fortunate enough to experience a portion of each of SCAN’s programs, and I hope to continue to contribute as needs arise. To date, I have worked on projects that I’ve had little or no experience in, particularly the research and compilation involved in grant writing, through out the next I hope that SCAN continues to provide new opportunities. Like many SCAN affiliates I am looking forward to Croquet Day, and Toast to Hope and getting to be a part of the behind the scenes elements that make a large scale event a success. There have been countless (and often conflicting) news stories in recent weeks about immigration in the United States. In our networks, the discussion–for years–has simply focused on how we can best care for and support these families. What is it like to be an immigrant and a parent? What are the unique fears, challenges, and needs faced by these families? We also highly recommend browsing our new Parent Connection Resource Guide for parenting classes and support groups for parents facing immigration and reunification. What resources do you depend on in your work with immigrant families? We know how critical it is that parents stay connected with their communities, especially when they are isolating themselves out of fear or frustration. Please share our newest Parent Connection Resource Guide with parents in your network. With more than 80 parenting classes, support groups, workshops and more for parents across Northern Virginia, it also includes a key to find programs offered in Spanish and other languages, as well as those that provide childcare. How are you keeping parents connected in your community? We’d love to include your programs in our next issue–let us know! FACT: Child sexual abuse is far more prevalent than most people realize. FACT: Child sexual abuse often takes place under specific, often surprising circumstances. It is helpful to know these circumstances because it allows for the development of strategies to avoid child sexual abuse. 81% of child sexual abuse incidents for all ages occur in one-perpetrator/one-child circumstances. Most sexual abuse of children occurs in a residence, typically that of the victim or perpetrator – 84% for children under age 12, and 71% for children aged 12 to 17. Sexual assaults on children are most likely to occur at 8 a.m., 12 p.m. and between 3 and 4 p.m. For older children, aged 12 to 17, there is also a peak in assaults in the late evening hours. One in seven incidents of sexual assault perpetrated by juveniles occurs on school days in the after-school hours between 3 and 7 p.m., with a peak from 3 to 4 pm. 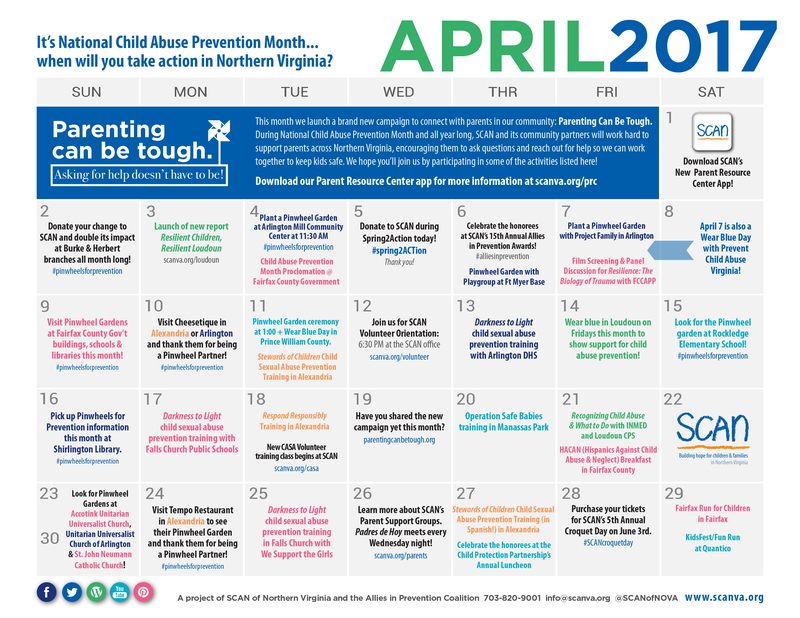 FACT: SCAN trained 213 individuals last year in the Stewards of Children curriculum, and we are scheduling trainings NOW for the year ahead across Northern Virginia. We need YOU to invite us to train individuals in the agencies, school districts, childcare centers, rec centers and faith groups in your community. Ready to take action to protect children and empower adults in 2017? Contact Tracy Leonard, Public Education Manager, at tleonard(at)scanva.org for details or to schedule a training. This will be the 15th year we celebrate the heroes who work passionately for the children, families and communities of Northern Virginia. Who will we honor this April (during National Child Abuse Prevention Month) with a 2017 Ally in Prevention Award? That’s up to you! Nominations are now open: please submit a nomination for someone in your community who is “rising above” in their efforts to prevent child abuse, support parents or strengthen families. Who can SCAN’s Allies in Prevention Coalition lift up with this honor? Who can we celebrate as a true leader? Who is someone who sets an example for all of us in the way they protect children and put their community first? Want to be inspired? You can meet last year’s honorees here. And remember, all nominations are due by February 10, 2017!